“Our national crisis isn’t really about Trump; it’s about what’s happening to the American people.” Long essay. 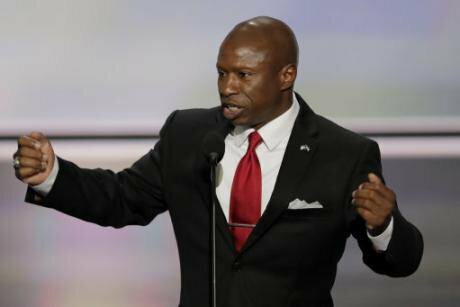 Darryl Glenn, Republican candidate for U.S. Senate from Colorado addressing Republican National Convention in Cleveland, July 18, 2016. Scott Applewhite / Press Association. All rights reserved.So many of the warnings and insights, historic parallels and cautions in Jim Sleeper’s March essay in Salon and AlterNet on what Trump's rise portends for America, even if he loses, are vindicated by this week’s Republican Party convention in Cleveland that openDemocracy has invited him to update it to take account of what's unfolding now, at this critical turning point for the United States. (Just under 7,000 words). As Darryl Glenn, a Republican candidate for the US Senate from Colorado, fired up the Republican National Convention against Hillary Clinton this week by saying, “We know she enjoys her pantsuits, but we should send her an email telling her what she deserves is a bright orange jumpsuit,” I pictured the beheadings of western foreign-aid workers in orange jumpsuits, as Glenn surely meant us to do, and I wondered why this black herald of a new Republican Party didn’t say that Barack Obama deserves to be lynched. Glenn’s audience went wild at his jumpsuit suggestion, leaping and shouting in an unintended demonstration that our national crisis isn’t really about Trump; it’s about what’s happening to the American people. What’s happening to us is what’s being done to us, and Trump, the outsider-insider, is exposing it more vividly than Clinton has done. Because he’s a compulsive marketer, not a producer or a leader, he can’t truly assess the crisis or offer solutions more substantive than empty slogans. But, like a flare, he lights up, at least momentarily, what others have kept dark. For example, as he swept four Republican state primaries on March 17, he did what presidential candidates seldom do: he named huge corporations — Apple, Pfizer and other wardens of this country’s ever-stronger Silicon Valley and Big Pharma cages — as ripe for discipline by government, thereby exposing the hypocrisies of both political parties’ establishments, without showing how he’d curb conglomerates’ cartel-like consolidations, tax evasions and inversions, and degradations of employees’ prospects. Bernie Sanders assailed Verizon in his final debate with Clinton, who maintained a purse-lipped silence on that company’s worker-busting CEO, who is among her donors. What Trump and hangers-on like Darryl Glenn do more effectively than Sanders did is stoke fear and rage, not hope, in the betrayed and bereft. And they target that rage against Democrats who are just as complicit as Republicans in financializing and corporatizing a political system that has become illegitimate, unsustainable, and delusional. What Trump and hangers-on like Darryl Glenn do more effectively than Sanders did is stoke fear and rage, not hope, in the betrayed and bereft. Most candidates in 2012 really did seem to have come from the moon as they prattled on about putting people’s money back in their pockets and rewarding their heroism in Iraq, even as many in the audience faced declining incomes, home foreclosures, the war’s lies and wounds, and the attendant perversities that are erupting daily into American civic and social life. Yet millions of citizens, not to mention hundreds of journalists, took the prattle seriously, as if it might explain what has befallen us. Never mind that “When PolitiFact was choosing its “lie of the year,” it found that that all its real contenders were Trump statements — so it collected his many campaign misstatements and gave them all the ‘lie of the year’ award,” as Nicholas Kristof noted. The cumulative effect of Trump’s torrent of accusations is The Big Lie technique, perfected in modern times by Joseph Goebbels, adapted in America by Joseph McCarthy. Hundreds of journalists took the prattle seriously, as if it might explain what has befallen us. Heated comparisons of Trump to Hitler do have a measure of validity; Trump isn’t as possessed and maniacal as der Fuhrer, but he opens long-festering wounds and stirs swift, dark undercurrents that all the other presidential candidates except Sanders have danced around without really touching. While Sanders played to democratic strengths and hopes, Trump has played mindlessly and malevolently to fear and rage, stoking what is known as ressentiment, in ways I want to describe. “I could stand in the middle of Fifth Avenue and shoot someone and my supporters wouldn’t leave me,” he has said, and his Hitler-like boasts and insults have shot new holes in the liberal democratic fabric of dialogue and trust. His way of talking separates words from deeds more brazenly than most folkloric American political snake-oil salesmen and sleazy senators ever did, leaving the words more empty, the deeds more brutal, and those of us who try to put words on things more breathless than ever before. He has also played cunningly on many people’s craving to be flattered and deluded into imagining themselves free when they’re being enslaved. In this, he’s somewhat closer to the wily Augustus, Rome’s first emperor and unctuous grave-digger of its republic, than he is to Hitler. Augustus’ wily transformation of republican citizens into subjects is recounted in Edward Gibbon’s Decline and Fall of the Roman Empire, which the American republic’s founders were reading as it was coming off the presses in the 1770s. The founders were taking a hard look at their fellow Americans and were becoming obsessed with how a republic ends. Gibbon, a deft a polemicist as well as an historian, showed them that many people will surrender its freedom not only to a violent coup but also to a charismatic leader’s smile and friendly swagger if they’ve become tired of the burdens of self-government and can be jollied into servitude – or scared into it, once it has become soft enough. Since the primaries, Trump has provided those spectacles of humiliation in abundance. But let’s try to catch our breaths and look carefully at what he has already done to public discourse and at how he has exposed the vacuum that already replaced what Americans once considered trustworthy political, cultural and, civic-minded business leadership. Then let’s examine how American leaders’ defaults have hurt voters whose confidence they’ve relied on, stimulating instead a self-perpetuating syndrome of resentment that’s as toxic as racism or McCarthyism and that is becoming more diffuse and free-floating. We are passing a tipping point: the new American ressentiment that’s on display in Cleveland, as it has been in the streets all over this country, unlikely to be repaired or put into remission, much less reversed, even if Trump’s campaign implodes. So let’s keep focused on what his rise has exposed not only about him but about the broad swath of the American people who are responding so virulently to him. 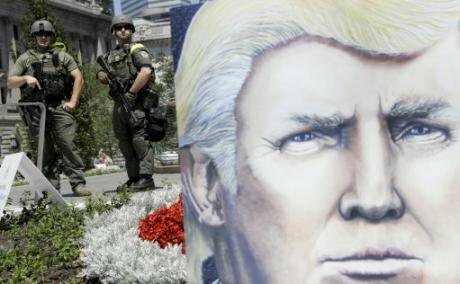 Law enforcement stands watch near large poster of Donald Trump at Public Square on July 19, 2016, in Cleveland, second day of the Republican convention. Patrick Semansky / Press Association. All rights reserved.Trump’s behavior has highlighted the difference between what children say and do on playgrounds, where they rough out rules for civility and cooperation, and what grown-ups are supposed to have learned and become committed to do to make a society work. The difference between Trump’s kind of free speech and the kind that actually enhances freedom isn’t a legal one but a psychological and cultural one: adults understand that what the Constitution rightly protects legally, civil society rightly modulates and anyone who lowers adult public conversation to the level of “So’s your Mom!” is dragging us all down. This plausible elaboration of Trump’s slogan, “Make America Great Again!” could have been written by a discerning observer of his methods, such as George Will or Tom Friedman. But it was written by the writer Francis Hackett, in a forgotten but still-arresting book, “What Mein Kampf Means to America,” which he published in April 1941, when many Americans still excused der Fuhrer’s demagogic vitality, vulgarity and brutality and when many American businessmen thought they could still make deals with him. It was the German people, of course, not the American, whom Hitler sought to resurrect, and he may have been something of a brute and a clown. But after all, Americans rationalized, Herr Hitler is taking on the scourge of bolshevism and shaking up the corrupt, old European conceits and arrangements that have clung to power even since causing the Great War and the Great Depression. Drawing historical analogies is a dangerous game. But it would be just as dangerous to ignore history’s cautions unless one is bent on repeating its follies. If Trump himself were a little more grandiloquent, he might justify his own demagoguery by adding that “all great movements are movements of the people, are volcanic eruptions of human passions…, and are not the lemonade-like outpourings of aestheticizing literati and drawing room heroes.” Ah, but those words were written by Hitler himself, in “Mein Kampf,” in 1926. Is that really so surprising? When Trump commingles racist nationalism by promising a wall to keep out Mexican rapists and Muslim terrorists with what sounds almost like socialism by promising a cornucopia of “jobs, jobs, jobs” and full healthcare for Americans, he reminds me that “Nazi” was an acronym for National Socialism. Drawing historical analogies is a dangerous game. But it would be just as dangerous to ignore history’s cautions unless one is bent on repeating its follies. To understand the difference between Trump’s understanding of freedoms of speech and entrepreneurship and the kind that American civic-republican civil society would nurture if those freedoms weren’t being eviscerated by the marketing riptides he’s riding, contrast Trump’s claim that “he gets things done” while lesser people dither with the following poignant observation about civil society that “SPHealy,” an online commenter, posted beneath something I wrote in 2007. “Back in the playground days we used to play basketball with whoever was on hand: 2-on-2, 3-on-2, 7-on-6, whatever. And people would rearrange and switch sides as needed to keep things even and fun. We were quite competitive and loved to win, but we were playing against our neighbors and schoolmates who were not necessarily our friends (and might even have been our enemies) but with whom we knew we needed to maintain at least non-destructive relationships for 7 or 8 more years. It takes one to know one, and the other plutocrats loathe him, but they deserve him. Many elite conservative efforts have been large-scale, long-term and tightly organized, nowhere more so than in the legislative districting scams described by David Daley in his new book Ratf**ked, which shows why nothing that happens in this year’s election can possibly loosen Republicans’ grip on the House of Representatives for the next decade or two. But Trump, that loose cannon, has blown open many of the elites’ other decorous, civic-republican covers and agendas, exposing them as the myopic and destructive maneuverings of plutocrats, even when he intends nothing more than to make room for his own plutocratic plans. It takes one to know one, and the other plutocrats loathe him, but they deserve him because they’ve never been able to reconcile their pious claims to uphold virtuous, patriotic, ordered republican liberty with their lust to ride tides of casino-like financing and predatory marketing that are dissolving republican virtues and sovereignty, tides that Trump himself rides as deftly as they do. 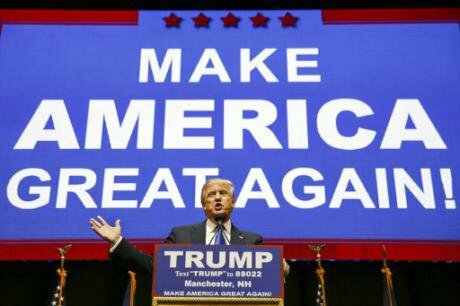 Donald Trump has enough votes to become nominee of Republican Party for President of the United States. 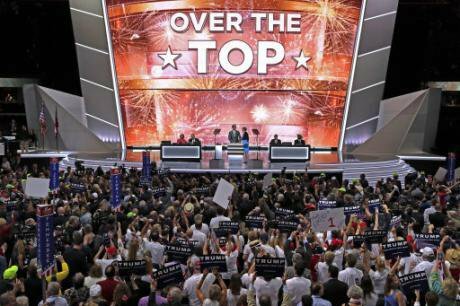 Day 2 of the Republican National Convention, July 19, 2016. J. Scott Applewhite / AP/Press Association. All rights reserved.Stunned by the sheer audacity of hopelessness in his insults and boasts, political and business leaders have finally become alarmed. Fashionable though it was only weeks ago to disparage Trump’s early victories by remarking that no one has ever gone broke underestimating the intelligence of the American people, it’s obvious now that Republican and Democratic elites are going broke by underestimating the angry, embittered intelligence of millions of Americans who’ve voted for Trump so far and the millions more who would do so in a general election. Narcissistic and opportunistic though Trump’s political heterodoxy is, it has shredded the credibility of conservatives who fantasize about restoring the capitalism of William McKinley, let alone that of Adam Smith and John Locke, and it has sucked the wind out of the sails of leftists who fantasize that a precariat-proletariat will rise again. Although he was right enough to call Trump a fraud, Romney and his cohort would have to become a lot less fraudulent themselves to discredit him or whoever his successor will be if he implodes. Trump, of course, is pumping something still worse. He’s no Hamilton or Madison, struggling to devise an order capable of balancing wealth-making with power-wielding and truth-seeking. He’s no Lincoln, envisioning a new birth of freedom, no Teddy Roosevelt birthing a “new nationalism” more ecumenical and progressive than anything Europe ever dreamed of, and no FDR cobbling together a New Deal. The problem is that none of the claimants to any of these legacies seems fit to dive into the abyss Trump has opened and face the demons in it and in himself. Instead, the other candidates have been pirouetting at the edge of the abyss, putting on clown shows and freak shows. Again, this is Hackett in 1941, but American elites have been clearing the ground for Trump’s great encampment, as Romney was doing by calling millions of Americans “takers” in 2012 and “suckers” last week. Takers and suckers some of them may be, but many are also shrewd, angry, bitter, and desperate. Although he was right enough to call Trump a fraud, Romney and his cohort would have to become a lot less fraudulent themselves to discredit him or whoever his successor will be if he implodes. Trump is an all-too American carrier of a chronic dysfunction that was lathered into our economic and social foundations and that cracked the country open in 1860, when the Whig Party collapsed amid a no-longer deferrable dispute over slavery and states’ rights, and in 1929, when the Republican classical economic and political liberalism that “translates pretty easily into… a sanction for popular impatience with governmental restraints on greed,” as the late historian Edmund Morgan put it, brought the country pretty close to implosion as fascism was rising in Europe. So, Trump-as-Hitler is really only the match lighting the tinder that many of us have prepared – the Clintons and the Chuck Schumers among us as much as the Bushes and Mitch McConnells, the “lemonade literati” of the prestige magazines as much as the Dinesh D’Souzas and Ann Coulters. We should stop flattering ourselves long enough to understand why so many of our fellow citizens are willing to gamble so pathetically that Trump will deflect the torrentially marketed civic mindlessness and malevolence that’s groping them, goosing them, intimidating them, bamboozling them, indebting them, surveilling them, and, in so doing, imprisoning them. Donald Trump, February, 2016, Manchester,N.H. David Goldman / Press Association. All rights reserved.Reckoning with this hard reality in the conservative National Review’s symposium “Against Trump,” R.R.Reno, editor of the conservative religious magazine First Things, noted that the people Romney dismissed as “’takers’ with no future in the global economy” made him the “failed candidate” that Trump calls him now. Reno stops short of acknowledging that the “middle-class consensus” owed a lot to massive public support for homeownership, to vigorous government regulations that supported union organizing and restrained the animal spirits of bankers, brokers, and campaign donors, and to the G.I. Bill and other extensive public funding of universities. From the 1970s on, Democratic and Republican elites have seduced Americans into surrendering those supports bit by bit. Although there were valid reasons (such as global and technological upheavals) to re-work some protections and let go of others, there were far too many corrupt and destructive reasons, too. The reckoning we’re experiencing, although it’s being distorted by Trump, is about what political and business leaders on both sides of the aisle (and the Atlantic) deserve. At Hilton Head and Davos, they tell one another, sometimes with stagey caveats and sighs, that recent meltdowns prove that most people aren’t capable of self-government and need to be ruled or finessed. Today’s elites cannot even rule themselves, let alone anyone else. And the armed, racist American goons and drooling fools circling liberal democracy’s proverbial town meetings in our nightmares don’t even nearly represent Trump’s other supporters, many of whom aren’t so different from many of the rest of us. Even the goons and fools weren’t born to do what they’re doing now, nor were they all disposed to do it back on the playground. The quiet little stabs of heartbreak and self-doubt that accumulated in tiny increments in their young lives as parents lost jobs, pensions, homes, mutual respect, and public moral standing have blossomed into open resentment that is seeking the right target. Their losses had many causes, but one seldom mentioned is that too many of us writers, perhaps including some who are reading this, have ignored or dismissed or disdained Trump’s supporters, compounded their distress with turns of a phrase, clicks of our brokers’ mouses, arching our eyebrows in faint but unforgotten disdain, or simple civic inattention excised with stereotypes, and, occasionally, empty shrugs and solicitous sighs over depictions of Bubba’s distress. Their losses had many causes, but one seldom mentioned is that too many of us writers, perhaps including some who are reading this, have ignored or dismissed or disdained Trump’s supporters. “Times have changed,” Edsall observed. “Today Muskogee, Oklahoma, a city of 38,863, has nine drug treatment centers and a court specifically devoted to drug offenders. A search for “metamphetamine arrest” on the website of the Muskogee Phoenix, the local newspaper, produces 316 hits. Donald Trump, greets the crowd, July, 2016, in Cincinnati.John Minchillo / Press Association. All rights reserved. Some of us saw this coming in 2008, even as the Republican National Convention of that year nominated the decent if limited man whom Trump mocked this year for having been captured in Vietnam. On the 2008 convention floor John McCain faced a somewhat unnervingly large contingent of young white men whose repertoire of political expression consisted solely of shouting "Yoo Es Ay! Yoo Es Ay! Yoo Es Ay! " – a chant we’re hearing often again this week. McCain said that he respects and admires Senator Obama and that "Despite our differences, we are all Americans. That's an association that means more to me than any other." All that misplaced fervor and rage reflected a lot more than young men's hormones and older men's uneasy consciences. These guys’ buffoonish, boorish chanting was only one side of them. They hadn't all curdled into fascists or even racists. A thwarted decency and clueless love in them, a yearning for something slipping away, was struggling to find some political defense against the affronts and distortions their love had suffered. In 1990, in The Closest of Strangers, I predicted that “the disintegration of white working-class family life, replete with the pathologies of violent essentially homeless youths,… may well overshadow the problems of the black underclass in the popular mind in the years ahead.” Now, 25 years later, encroachments on their freedom and dignity have generated not only family breakdown and drug abuse in places like Muskogee but countless other stresses and humiliations that erupt in road rage, lethal rampages at store openings on sale days; extreme fighting or cage fighting, the gladitorialization of college and professional sports, and escapist, demoralizing entertainments, including reality TV and Trump’s own show The Apprentice, which ran for nine seasons. And how much human history and psychology need one know to see that when demoralization and slavery like this are deftly managed, they can become almost as seductive as they are painful? How many Americans now enact subtly internalized humiliations and cravings for vengeance sexually, eroticizing pain instead of challenging its sources? How many Internet ventures are hollowing out children’s sense of themselves as sexual beings and reasoning citizens capable of political deliberation and action? Under banners of “free speech,” this market-corrupted and soul-corrupting “culture” is inundating us not mainly with artists' art, activists' appeals, or other creative or political offerings but with messages from anonymous announcers and decorators and corporate "sensors" (not censors) that have been designed to bypass our brains and hearts on their way to our lower viscera and wallets. The more that these relentless, demoralizing pressures reduce sovereign citizens to chasing vapid consumer sovereignty, the more we’re like flies trapped in a spider’s web of those 800-numbered, sticky-fingered pick-pocketing lenders, insurers, pharmaceutical producers, and other swirling whorls of anonymous shareholders whose managers are dissolving our freedoms, not out of malevolence or conspiracy but out of mindless, mandated, greed. 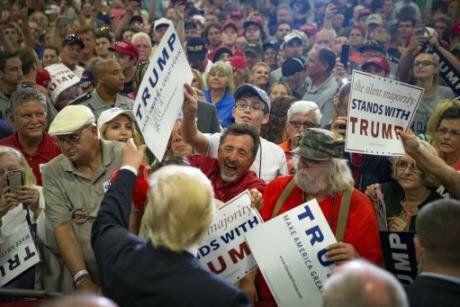 Trump’s supporters even imagine that he’s their megaphone against Citizens United’s rich beneficiaries. But if he wins, they’ll have a let-down too wrenching and violent for the American republic to bear. They may end up doubting that the republic deserves to survive at all. Meanwhile, though, these people whom elites dismiss as knuckle-dragging, featherbedding racists are giving a new twist to the old Gospel line, "God gave Noah the rainbow sign, no more water but fire next time". 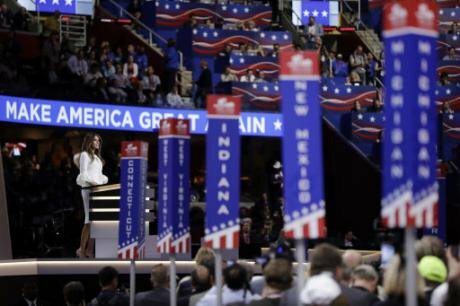 Melania Trump on Day 1 of Republican National Convention in Cleveland. Matt Rourke / Press Association. All rights reserved. “Mr. Trump’s brand of resentment politics,” as New York Times reporters Jonathan Martin and Alexander Burns called it, rides what’s known as ressentiment, (in French it’s pronounced “ruh-sohn-tee-mohn”), a public psychopathology in which gnawing insecurities, envy, and hatreds nursed by many people in private converge in public in scary social eruptions that present themselves as noble crusades but that diminish their participants even in seeming to make them big. In ressentiment, the little-big man seeks enemies on whom to wreak vengeance for frustrations that are only half-acknowledged because they come from his exploitation by powers he’s afraid to challenge head on. No wonder that the 2012 Republican National Convention roared with such delight as Clint Eastwood interrogated an empty chair symbolizing an invisible President Obama. No one wanted to know what Eastwood would have dared to say to the real Obama or what the President would have said back. No one wanted to know what Eastwood would have dared to say to the real Obama or what the President would have said back. Ressentiment’s gusts of collective passion touch raw nerves under the ministrations of demagogues and an increasingly surreal journalism that prepares the way for them by brutalizing public discourse. In the 1976 movie Network, which depicts the profit-driven derangement of television news reporting, manager Diana Christiansen tells her staff, “I want angry shows” because Americans want “a mad prophet, denouncing the hypocrisies of our time.” A demagogic network anchor rouses his viewers to shout, “I’m mad as hell and I’m not going to take it any more,” even as he herds them like sheep. Ressentiment’s gusts of collective passion touch raw nerves under the ministrations of demagogues and an increasingly surreal journalism that prepares the way for them by brutalizing public discourse. The legitimate grievances fueling ressentiment sometimes drive its eruptions to a fleeting brilliance, as when Palin tapped deeply into currents of thwarted love and hope in her speech to the 2008 convention with. But, like her public persona, such gestures soon curdle and collapse, tragi-comically or catastrophically, into their own cowardice, ignorance, and lies. Where to? Can Trump play Augustus, not Hitler? 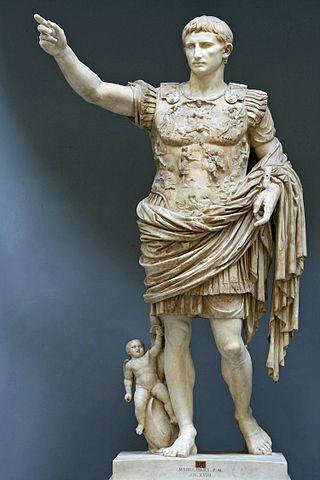 Enter Rome’s first emperor, Augustus Caesar, who, let us remember, was much on the minds of the American republic’s founders. Gibbon wrote that “a slow and secret poison” had entered “the vitals of the empire,” sapping from citizens “that public courage which is nourished by the love of independence, the sense of national honor, the presence of danger, and the habit of command.” In time, “They received laws and governors from the will of their sovereign, and trusted for their defense to a mercenary army.” “History does not more clearly point out any fact than this, that nations which have lapsed from liberty, to a state of slavish subjection, have been brought to this unhappy condition, by gradual paces,” wrote the American founder Richard Henry Lee. Benjamin Franklin voted for the Constitution in 1787, he warned that it “can only end in Despotism as other Forms have done before it, when the People shall have become so corrupted as to need Despotic Government, being incapable of any other.” Crafting stories that people can love without hating requires the seasoned narrative and political strengths that Madison, Hamilton... the two presidents Roosevelt, Gandhi, Mandela, King, Havel, and others have had in abundance and that Trump does not. Conservatives need to acknowledge that the reverential, or republican, or corporate strains in capitalism described by Adam Smith, John Locke, Edmund Burke, Russell Kirk, Clinton Rossiter, and others have been transformed almost beyond recognition by casino-like financing, omnivorous marketing, and worse. only radically different arrangements can give classically liberal freedom, let alone “free enterprise,” a chance to live another day. Trump is betting that Americans cannot help but love and believe in his “Make America Great Again” nationalism. He wants us to love him as its savior, even though, in “getting things done,” he’d crush our democratic opportunities. He’s credible only because our current, corrupted regime already crushes so many such initiatives and needs to be shaken to its roots and reconfigured. It will require more than idolizing a deal-maker who already idolizes himself. Democratic movements have benefitted from knowing some history, from having some clear principles, and from finding ways to weave enough mutual commitment and trust to stick together against obstacles and allurements that seem insuperable. Crafting stories that people can love without hating requires the seasoned narrative and political strengths that Madison, Hamilton, Jefferson, Washington, Lincoln, the two presidents Roosevelt, Gandhi, Mandela, King, Havel, and others have had in abundance and that Trump does not. Who knows if good citizens and wise leaders can weave a new social fabric now? One of history’s encouraging lessons is that, time and again, they have. We’re about to find out if they can again. Augustus of Prima Porta, Ist century, Vatian Museum. Wikicommons/ Till Niermann. Some rights reserved.